The AMC spin-off is going darker than ever before. The fourth season of Better Call Saul starts with another black-and-white flash forward in the life and times of Jimmy McGill, aka Saul Goodman, aka. Gene the Cinnabon manager (Cinna-Saul?). The camera lingers over abandoned kitchen equipment before landing on a comatose Saul laying on the floor. He’s had a panic attack. After he’s rushed to the hospital, Saul’s stress redoubles when the attendant nurse can’t find his medical information, and it seems his fake identity is going to be exposed. Saul can outrun the law, but his guilt is catching up to him. I’d argue that’s a good thing. In his book The Revenge of Conscience, philosopher J. Budziszewski claims human beings are incapable of squelching our consciences. We will always see some of our actions as wrong, he argues, and if we refuse to listen to our conscience, that repression will turn into self-righteousness, self-justification and ultimately self-destruction. Saul Goodman is the living embodiment of Budziszewski’s theory, Jimmy’s repressed conscience has turned into the embodiment of amorality. In the premiere of season four, this turn marks the origin of Saul Goodman. In what may turn out to be the defining moment of the series, Jimmy realizes a childish act of revenge—reporting his admired brother Chuck’s mental illness to his health insurance—was a catalyst in Chuck’s suicide. If Jimmy hadn’t been so petty, Chuck might still be alive. Jimmy’s conscience can’t handle this reality, so he shoves down the truth and whistles as he makes the morning coffee. Kim and Howard look on, stunned. It’s a brutal moment, and one that harkens back to Walter White whistling after the death of a child. Except Jimmy is no Walter White. While Breaking Bad and Better Call Saul both center on the glacial moral deconstruction of their protagonist, they approach that downfall from opposite ends. Despite the title of his show, Walter White never did “break bad.” He was always a high-functioning narcissist. He didn’t become Heisenberg so much as his inner Heisenberg roared to life after the cancer scare, desperate not to die an impotent, forgotten, unimportant middle-aged man. 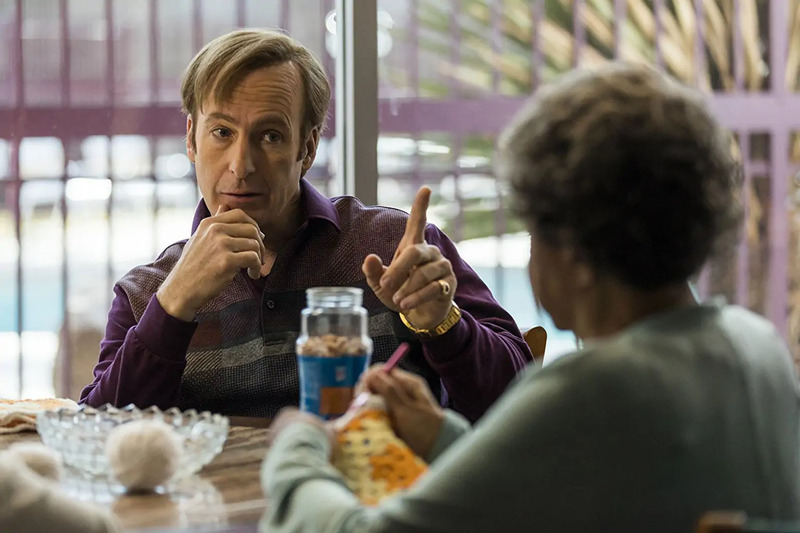 Jimmy McGill is flawed and self-destructive, but unlike Walter, he’s empathetic, kind and generous. When Jimmy sacrifices his self-interest to restore the reputation of the older lady in the nursing home (granted, a reputation he sabotaged), it’s kinder than literally anything we ever saw Walt do over five seasons of Breaking Bad. Walter White was never bothered by his capacity for evil; he was bothered by the potential consequences of his evil. Walt wore goodness like a suit designed to make him acceptable to society. He was the type of guy who would make a pro-con list for killing someone, as though “Judeo-Christian ethics” can be some bullet point on a list. Jimmy, however, wants to be a better person through and through, even if his own character keeps assassinating those attempts. Jimmy’s conscience isn’t a social construct, and the tragedy of Better Call Saul is how he fails to be faithful to that conscience. Jimmy isn’t doomed to become Saul, though. If he could find the courage to face what he’s done, to confess it and grieve and move forward, he would almost certainly find a life for himself. Kim clearly loves him and needs him to grieve with her, and when Jimmy’s law license is valid again, he could step back into a successful career. A version of human goodness is possible for Jimmy, if only he could believe himself worthy of it. In the classic Dostoyevsky novel Crime and Punishment, main character Raskolnikov emotionally and spiritually collapses after committing murder, eventually turning himself in for the crime. In prison, Raskolnikov experiences an unconditional love that reaches his soul, and the book ends with the tantalizing hope that no one is beyond redemption, even the chief of sinners. Maybe this is where Better Call Saul’s flash-forwards are taking us, to a man whose conscience won’t die no matter how badly Cinna-Saul wants it dead. Walter White’s journey had to end in destruction: He teetered on sociopathic in his ability to shut down his moral core. But that isn’t this story—Better Call Saul truly does stand on its own—and I am hopeful the show will end not with the death of Saul Goodman, of course, but the resurrection of Jimmy McGill.